After checking out from the hotel during our weekend staycation (more on that in my wife's blog), we wanted to see the nice anime movie of detective Conan. But we noticed that there was also another movie playing in the cinemas which we had not seen. So we decided to have a movie marathon by seeing this movie first that had its last show of the day at 3.40 PM in Pacific Place. Now what was the movie about? Due to the nature of the movie, I would be providing a very very brief synopsis instead of my usual few paragraphs of brief Story Line. Sergeant Mike Stevens (Armie Hammer - The Lone Ranger, The Man from U.N.C.L.E etc) and his partner Tommy Madison (Tom Cullen - Downton Abbey TV series) were assigned to do some military mission somewhere in Africa. After the mission, both of them were being chased by the enemy's army and were later trapped in the dessert where people have put mine bombs. With the reinforcements more than 2 days away, lots of things have to be faced from the sand storm, hallucinations, the drastic change of weather not to mention the lack of water. This movie is rather a heavy one. As mentioned on my title, this was a psychological drama thriller. That said, it is not the type of full action movie with full special effects. The movie emphasizes on the survival and challenges these people have to face. Therefore it was having more dramatic moments rather than the action scenes. However, the special effects for this kind of movie was surprisingly quite good. It did not seem to be a very cheap B category movie. Regarding the movie itself, there were quite numerous intense moments where you would be caught in the suspenseful mode of whether it was going to end good or bad. I know the audience including my wife were sometimes amazed of the misery endured. My wife was definitely touched by some of those very emotional moments as well. The acting of Armie Hammer here was quite powerful to my opinion. This movie also have other supporting roles which were shown through glimpses of memory and hallucinations. Those that stood out were the role of the Berber native (played by Clint Dyer) and Mike's fiancée Jenny (played by Annabelle Wallis - The Mummy 2017 version, King Arthur: Legend of the Sword etc). The Berber guy was a unique character and gave a little bit of color to the movie, while Annabelle Wallis despite having little screen time, I think she seemed livelier compared to her role in The Mummy. My personal view of the movie is it actually was quite good in term of giving us surprises and intense moments. I think the background history of Mike was shown quite nicely in a slow pace until it finally revealed the complete story. Though I felt that one of the last scenes was taking a bit too long. But overall, this movie was not bad and my wife and I pretty enjoyed it as it also had some moral message. And one more thing, the ending to this movie might be interpreted differently by audience. Some may be able to accept it, and some might not. You will have to see it by yourself to judge it. So if you are looking for a serious psychological drama thriller with war background, then you might enjoy this one. But you could not compare it with a more powerful movie that I felt having a bit similarity titled Buried (with the main actor Ryan Reynolds). 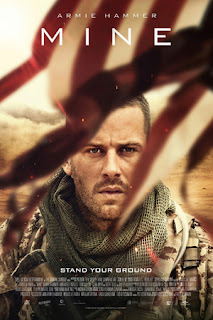 Now if you are looking for a war movie with lots of gruesome war scenes, then this movie would not be to your liking. The choice is yours.